Acoustic metamaterials can manipulate and control sound waves in ways that are not possible in conventional materials. Metamaterials with zero, or even negative refractive index for sound, offer new possibilities for acoustic imaging and for the control of sound at subwavelength scales. The combination of transformation acoustics theory and highly anisotropic acoustic metamaterials enables precise control over the deformation of sound fields, which can be used, for example, to hide or cloak objects from incident acoustic energy. 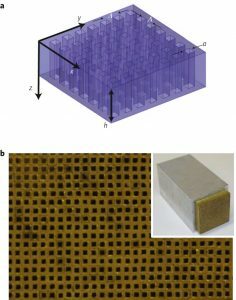 Active acoustic metamaterials use external control to create effective material properties that are not possible with passive structures and have led to the development of dynamically reconfigurable, loss-compensating and parity–time-symmetric materials for sound manipulation. Through advanced computation and modelling our group aims at creating new opportunities for these artificial structures.